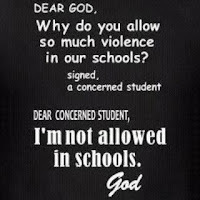 A FB stream: "Violence in Schools is caused by a Lack of God in Schools". *This is an actual conversation I wanted to save for posterity. I've used http://www.randomnames.com/ to change the names, since the OP had the image (and therefore the thread) posted as "Friends only". in Church and OUT OF SCHOOLS. 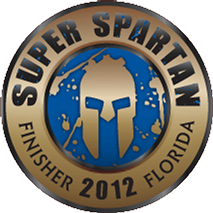 Husband and I ran the 8.1 miles obstacle course and trail run called Super Spartan, and we did it in 3 hours and 15 minutes. We signed up for it and began to train. Immediately School set in and we stopped training! We were unprepared for the run, but so were the people we went with (his buddy Daniel and Daniel's sister Donna.) It was the hardest thing I've ever done. I think it was harder than the 2.5 mile ruck on fractured legs. I didn't cry, like I did back then, but I'm a little older now. :D I'm bruised, lacerated, and picking mud out of pretty much everywhere. I had so much fun. Recently, my uncle Bill voiced his displeasure at the impropriety of an alleged order for the Flag of the United States of America to be flown half-mast for the funeral of recently dead singer Whitney Houston. Being a bit of a flag-etiquette buff I had to weigh in. In short, the Gov of the state where she's a resident is authorized to order it lowered in HIS jurisdiction. I disagree that is should be. This isn't to dishonor her memory, but because I think lowering it for her pales the honor of those it is authorized to be lowered for. Below you'll find the Wiki on USA Flag Etiquette, and my personal rant. Everything I wanted to get done today: German Übungen, German study guide, Physics Lab report, Chem lab report, Chem Problem set 5, Chem prelab. I've worked 14 hours straight, with maybe 1 hour of dally in there (including lunches) and probably an hour and a half of the work they pay me for. I finished the first three and did the two take-home clicker questions. 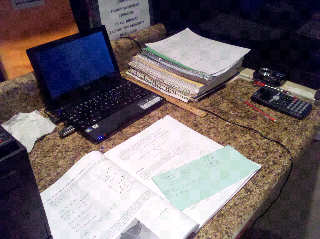 Still so much to do, and not enough time to do it all.